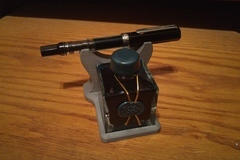 This is a simple display piece to hold a bottle of J. Herbin 1670 collection ink and a fountain pen. The pictures show it with a bottle of Emerald of Chivor and a TWSBI ECO. It should be able to fit most large pens with ease.